Here are some interesting finds on YouTube; including Manny taking some batting practice swings at Dodger Stadium a couple of days ago. How about some fireworks at Dodger Stadium. Part 2 of the fireworks. The Dodger Italian connection. This is a fun watch; especially hearing Tommy talk about how he use to sneak out of the house to play ball all day and expecting the "strap" when he came home that evening. Here are some great vintage Dodger related items from Huggins & Scott Auctions. This is a very rare 1899-1900 Supplement (M101-1) from The Sporting News. Made of glossy paper stock these 10" x 13" vignetted portraits where inserted in weekly issues or could be had in 50 lot portfolios with an annual subscription of $2.00 to the magazine. 62 different sheets complete a set. They were produced by National Copper Plate Co. who also made their own set a year earlier that was bound in a book. Below is Hall of Famer Wilbert Robinson during his playing days with the Baltimore Orioles. He was a catcher and a leader on the team. 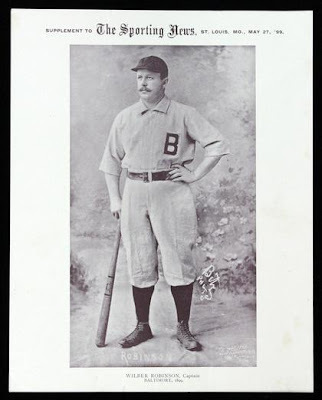 Robinson once played behind the plate during a triple header in 1896 and then played both ends of a doubleheader the next day. We Dodger fans may know him as "Uncle Robbie." He was the skipper of the Brooklyn team from 1914 to 1931 and compiled a record of 1375-1341. He was so beloved in the borough they nicknamed the team the "Robins" in his honor. It sold for $1200.00. Oftentimes, the best way get a nice group of vintage memorabilia is to chase after lots like the one below. Here is a grouping of 10 Brooklyn Dodger items that sold for $350.00. On the left is a 1963 Hall of Fame bust of Jackie Robinson. They were originally sold at Cooperstown. It is unusual to find it with an original box. 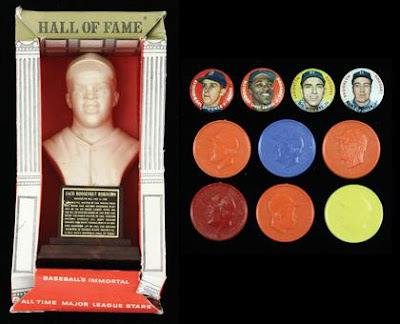 The four round portraits on the right are pins produced by Topps in 1956. From left to right: Karl Spooner, Sandy Amoros, Pee Wee Reese and Duke Snider. Finally the colored disc directly below the pins are 1955 Armour coins of Gilliam, Reese (2-orange and yellow) and Snider (3-orange and yellow). I've never seen the movie, but this poster looks great. What happens when a boy who loves baseball discovers that he has a strange bump on his arm? Simple! The lad takes the world by storm by becoming a "miracle kid with a super ZOOM ball". 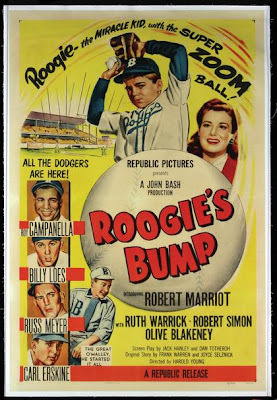 Such is the plot for the 1954 film Roogie's Bump, an inspirational tale that features cameo appearances from members of the Brooklyn Dodgers. This "Roogie's Bump" one-sheet movie poster is linen backed for easy display. The approximately 28x41 Republic poster features stars such as Campanella, Loes and Erskine.